Glorias are elaborated with pasteurized 100% fresh goat's milk and the best variety of nuts with dry fruit (dates, apricot, and prunes). This product has great acceptance in your palate. Las Glorias de Sevillanas estan elaboradoas con leche pasteurizada de cabra 100% fresca y la mejor variedad de nuez y fruts secas (datil, chabacano y ciruelas). Este producto tiene gran aceptacion en el paladar de los consumidores, tanto de Mexico como en otros paises. I could eat 100 of them!!! 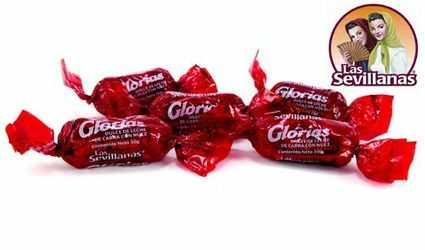 My first Gloria dulce was on a visit to a cousin in Matamoros. Rich, creamy, caramelly and easy on my old teeth. At last I find a source who can deliver to me in Texas. Hallelujah!!! My favorite candy. Love the caramel with nougats. I try not to eat all of them at once. excelent candy ,delicioso,one of the best i have try ,love it .. This is my favorite candy ever made! And as a candy fanatic, that's saying a LOT! Dulce de leche center, crystalized outside mixed with nuts. YUM!